Toenail fungus, medically known as Onychomycosis, is a potentially embarrassing problem which can be difficult to treat. Doctors will generally treat the infection with pharmaceuticals. 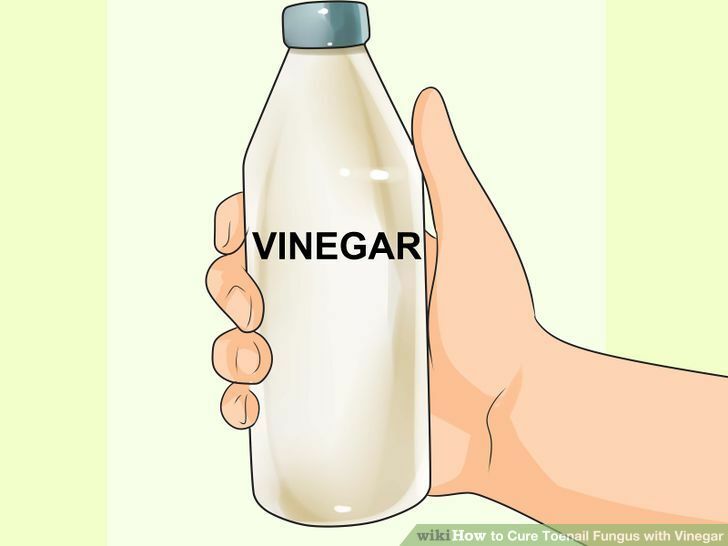 Although there’s no evidence that the use of vinegar can help stop mild to moderate cases of fungal infections, there are anecdotal accounts of successful self-care, and it’s a low-risk treatment if carried out properly that might work in conjunction with preventative care. Some have alternated using vinegar one day and 2% hydrogen peroxide the next. Get a nail file and nail clippers. Always clean the area as best you can before applying home remedies or doctor prescribed methods. Trimming will help whatever cure is being employed to reach more deeply into the nail. Trimming the nails can reduce pain and discomfort. Don’t file the nail too short as this could result in another problem, such as ingrown nails. Always clean your file and nail clippers after. Pour the vinegar into a large bowl. Mix in equal parts vinegar and hot water. Soak the infected foot up to two times a day. Do not soak for more than thirty minutes at a time. Try to apply the vinegar directly to affected areas. More exposure of the infection to the vinegar may increase results. You should begin to see improvement within a week or two. Allow the nails(s) to dry. Letting your nails dry totally before putting on socks or shoes will help to stop the fungus. 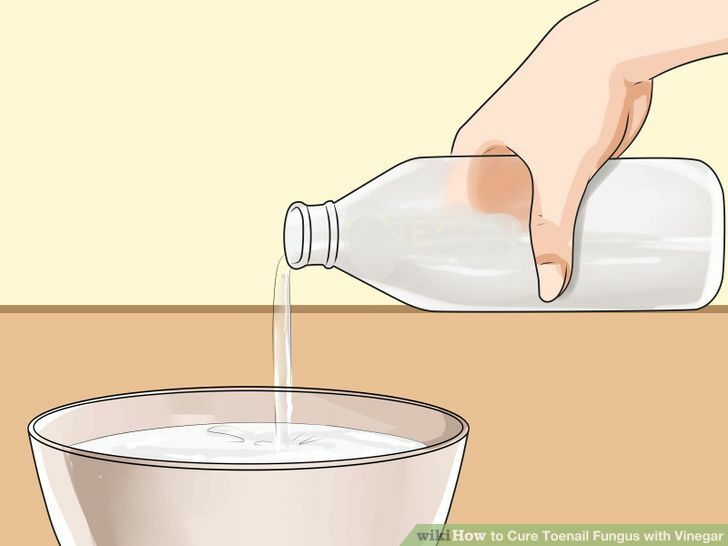 By depriving the fungus of a moist environment, you help keep it from spreading to other nails. Always strive to keep your feet dry and cool. Warm and moist environments are favored by fungus. Keep watch over the nail. Practice proper nail and foot hygiene. Clean your nails and keep them trimmed evenly and short. 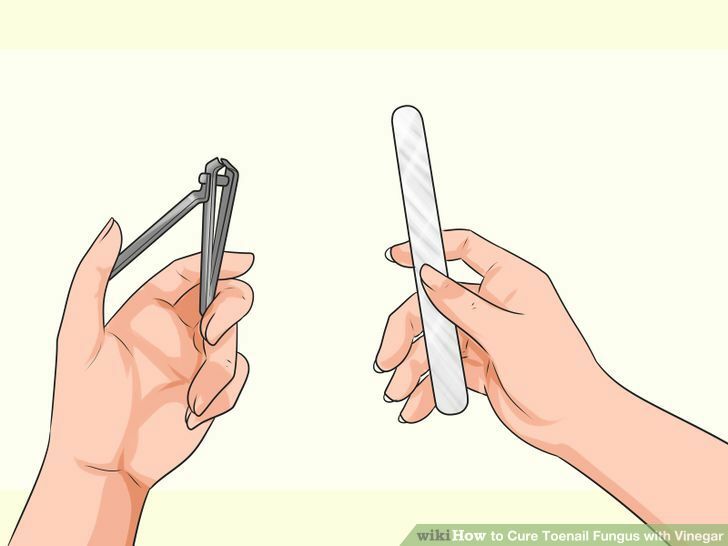 Do not use the “scraper”on any other nail unless it has been first disinfected, since you can spread the fungus this way. Keep watch over the progression of the infection to learn if your treatment is working or not. If the infection gets worse, see a doctor. Try other alternative methods such as snakeroot extract and tea tree oil applications. Follow easy preventative measures to avoid nail fungus. Wear sandals or flip flops when in public areas. Never go barefoot. Clean and wash your feet everyday. Keep your feet cool and dry. Having too much moisture or warmth, brought on by socks or shoes, can encourage nail fungus to grow. Find shoes and socks that allow your feet to breathe. You should also make sure that your socks are always clean as they can harbor fungal spores. Make sure your shoes fit well and there is enough room for your toes. Discard old footwear that was worn while having an infection. Treat athletes foot immediately. Allowing this fungal infection to remain on your foot increases the risk of it spreading to your nails. Stop the potential spread by treating athletes foot as soon as you can. Mild cases of athletes foot can be treated with over-the-counter medications. Difficult cases may require prescription strength medication. Ask your doctor which is right for you. Care for your nails. Always keep your nails trimmed evenly and short. Use a different pair of nail clippers for your infected nails and your healthy nails. Using the same pair can spread the fungus to healthy nails. Trimming your nails can also help to reduce other nail aliments (breaking or chipping). Clean and sterilize your nail clippers and files after use. Know the symptoms. Identifying nail fungus in the early stages can be difficult. 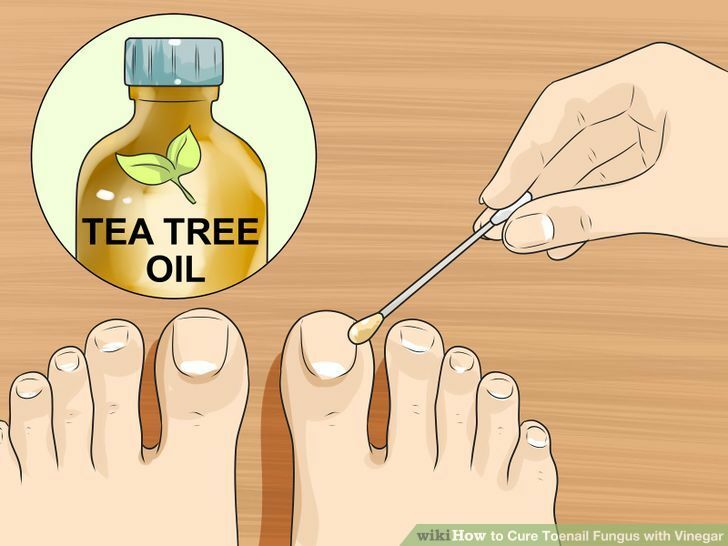 Consult your doctor if you have questions about nail fungus. Review the following common symptoms if you believe you may have a fungal nail infection. Crumbling of the outside edges of the nail. Debris trapped under the nail. Loosening or lifting up of the nail. Loss of luster and shine on the nail surface. White or yellow streaks on the side of the nail. 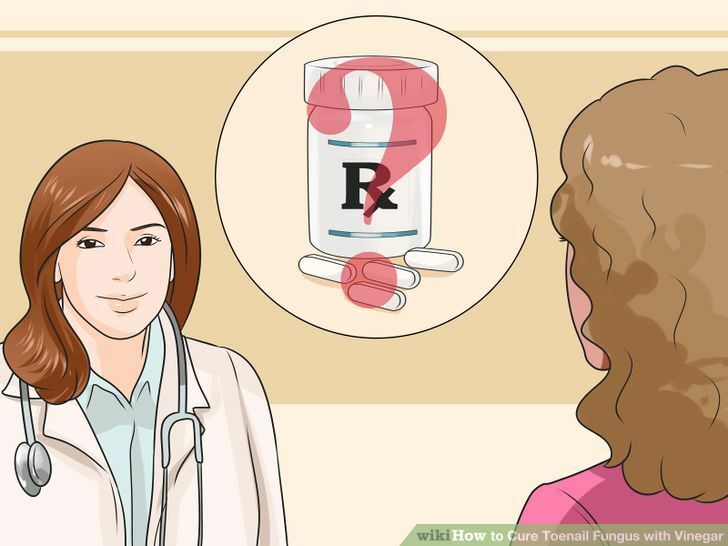 Prescription anti-fungal treatments, usually taken orally. In rare cases, the nail may need to be removed. Understand the outlook. The fight against nail fungus can be a slow one. Continue regular treatments to ensure the best results. Nails grow very slowly. Positive responses to treatments may be just as slow to see. 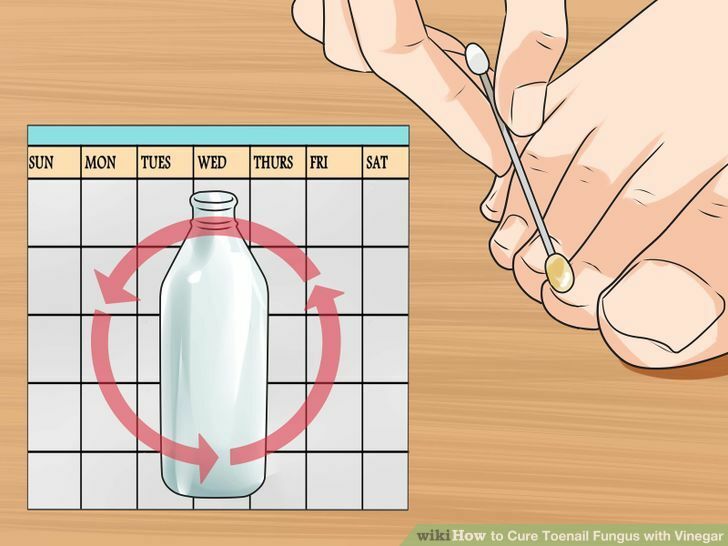 Fungal infections can return, even after being cured. It may take several months for a new and healthy nail to grow out. Continue applying vinegar each day until this occurs. If you have a severe fungal infection, see a health care practitioner. Plain vinegar of any brand or type. Nail File or nail clippers.